The most influential billionaire in America is Peter G. Peterson. 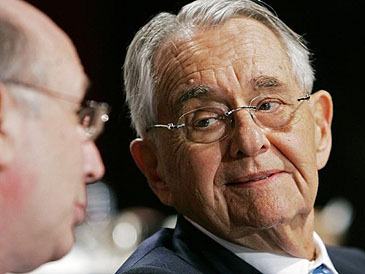 The son of Greek immigrants, Peterson, 86, served as Commerce secretary under President Nixon, then became chairman and chief executive of Lehman Bros. Subsequently, he made his big money as co-founder of the Wall Street private equity firm Blackstone Group. ….Peterson’s views are subtly infiltrating the Washington debate — which is why Americans should start getting worried about him. He isn’t content merely to express concern about the federal deficit. His particular targets are Social Security, Medicare and Medicaid, which he calls “entitlement” programs and which he wants to cut back in a manner that would strike deeply at the middle class. I encouraged Alicia Munnell […] to write on what to do about Social Security and what not to do, particularly to rebut Wall Street banker Peter G. Peterson, then as now a strident critic of the program and an unrelenting prophet of demographic doom. In other words, Peterson has been a prophet of doom for 30 years now, and so far his actual influence on Social Security has been approximately….zero. The 1983 commission didn’t pay any attention to him, Bill Clinton didn’t pay any attention to him, and the 2005 attempt to privatize Social Security failed utterly. His influence on the federal deficit has likewise been approximately zero, and his influence on Medicare has been, if anything, even less. He wears nicer clothes, but he’s basically had about as much impact as your average curmudgeon holding forth on a soapbox in Hyde Park Corner. There are, of course, plenty of people who say they hate the deficit and plenty of people who have it in for Social Security and Medicare. It’s just that most of them are tea party Republicans who adopt these positions when they’re politically convenient and drop them when they aren’t. Pete Peterson had almost nothing to do with it, and his influence within the tea party movement is pretty much nonexistent. He’s had a bit more influence with the centrist Washington Post-ish crowd, but frankly, even there it’s not at all clear to me that their opinions owe much to Peterson. This stuff is in their DNA. I could be wrong, I suppose. Certainly Peterson has kept up a steady drumbeat of background noise about entitlement programs, and that kind of thing always sinks in at least a little bit. But he’s never built up a serious political constituency, the way that folks like Grover Norquist and Karl Rove have, and the Beltway elites who take his money and cite his white papers are mostly people who already agree with him anyway. Still, maybe this is his moment. Maybe after 30 years of futile effort, the current political atmosphere is finally providing him with a willing audience for his message. Maybe he’s finally going to make a difference. But I kinda doubt it. Despite his money, he’s just not a player. In fact, far from being America’s most influential billionaire, Pete Peterson might well be the guy who’s wasted more money on political causes than any other billionaire in history.